When is the last time you read a great book and didn’t want to put it down? My favorite book is probably Big Magic by Elizabeth Gilbert. She speaks my language. I was so happy to read that book because what she talks about is connecting to your creations on a soul level. Or maybe you love a series on Netflix or Hulu and can’t wait for the next episode. I’m giving you a brief lesson in creating content and how to repurpose it so you can leverage your time. It’s inviting people into a deeper possibility in their life. No matter what you sell, whether it’s art projects for moms to ignite their creativity, to finding awesome insurance rates for your clients, to helping people buy or sell a house, to coaching people difficult transitions in their lives, what you do matters. The key is to help people see why your services and products matter to the person who’s buying your stuff. To help you create content that captivates your audience, here are two questions from my Intuitive Marketing Method™ that will spark some ideas. I’ll include an example of it below, too. What has your client already tried to solve the problem your product or service helps them with? What is one benefit of the service or product you are selling? When you answer those two questions (I take people through these questions plus a lot more when I work with them in my marketing workshop), you turn that into content to share. Then you repurpose that content. First, what are you offering? 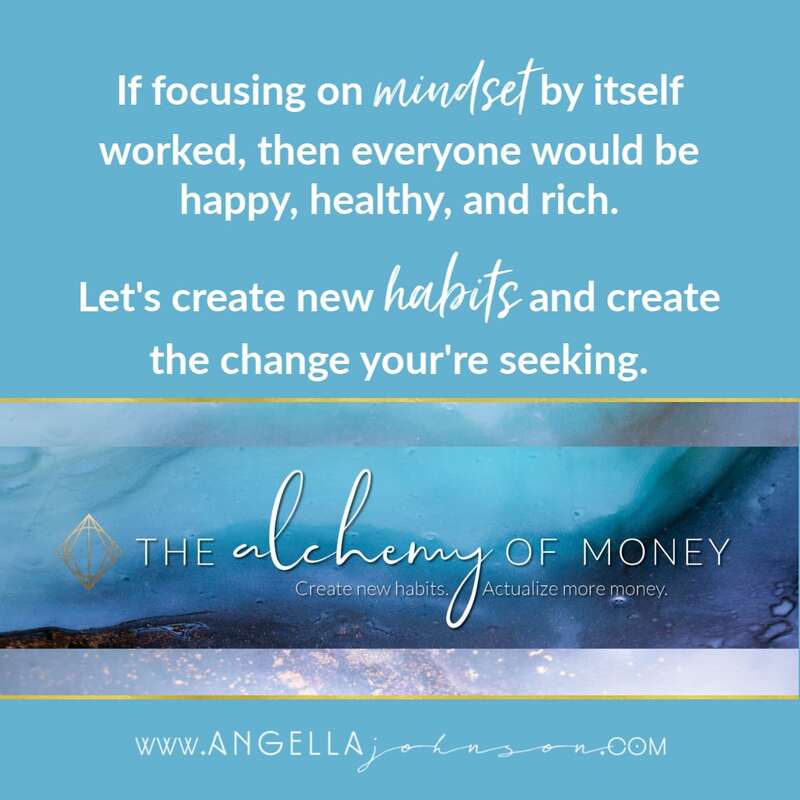 In this example, I’ll use my Alchemy of Money program, which helps people create a new relationship with their money. My clients have tried all of the mindset stuff – everything from healing to hypnosis to affirmations to reading books. Now, you turn this into a story, either something you have experienced or one of your clients and you create a video, blog, social media post, etc. out of it. After you paint the picture of identifying with the struggle of the situation, invite people into a new possibility. What’s one thing they can do to change their situation? From that piece of content, invite people to do something. It can be to opt-in for something, to contact you, to comment below with their top question, etc. When you share content like this that is directly related to the thing you’re selling, when it comes time to make a direct invitation of, “hey, buy this thing,” then people are engaged with you and they are ready to receive your invitation. The post was a combination of the story I told about my own money turnaround and a direct invitation to the thing I was selling. You would follow the same process with the other question I posted above and create a piece of content out of that. With two questions, you could create enough content for a month. Important tip: If you hate to do video, then don’t do it. For me, I’m a writer. I love to write and so my content always starts with writing. Then I turn it into a video, social media, etc. Now, let’s briefly talk about repurposing your content. Who wants to be creating a bunch of stuff for all of the places we’re supposed to be visible? Who has TIME for that? I’d much rather be hanging out with my hubby, listening to good music, or spoiling my “littles” aka nieces and nephews. So you create one piece of content and you turn it into a video. Then you extract a few lines and turn it into a meme for social media. You post the thing on your blog and extract a few lines from your blog and turn them into memes for social media. On your memes, you link back to your blog so people can read the full thing. Create ONE piece of content and put it in multiple places. Or if you have a team, you create the content so it’s in your voice and they do the repurposing for you! You can be in multiple places EASILY with just one piece of content. And the best part? Your content is connected to what you’re offering. It’s full of value for your audience. It attracts the right people and repels the people who aren’t interested, which is what you want. And it engages with people. We don’t care about a huge audience, we just want an engaged audience. And when you do this consistently, not only do you have time for the things that matter. But you also have awesome content that practically does the selling for you. P.S. This is a brief version of one of the things I teach in my Intuitive Marketing Workshop so check it out if you haven’t already. And if you’re already registered, you’re going to love what I’ve got in store for you.